Yu-Gi-Oh! 5D’s Tag Force 4 marks the first appearance of the new animated TV series on PSP, and uses plot elements from the show’s ‘Dark Signers’ episodes within its Story Mode. The new game’s graphics have been designed to perfectly recreate characters and settings from the TV show, with stunning anime likenesses bringing the game’s 14 duelists, and a huge supporting cast, to vivid life. Likewise, the same visuals are used to detail the many traps, spells and monsters that are used during battles, with in-game cameras panning to show off the various conflicts from a series of stunning vantage points. After entering the shop, press Right(5), Square(7), Select(3) to unlock the High Noon Constellation pack. Yu-Gi-Oh! GX Tag Force: The Winged Dragon of Ra, Philosopher’s Stone – Sabatiel, Crystal Skull, Jinzo (Anniversary Edition), and Red-Eyes Black Dragon (Anniversary Edition); alternate Mina Simmington as an opponent; and Triangle – Circle for use. Yu-Gi-Oh! GX Tag Force 2: Slifer the Sky Dragon (Effect Monster), Power Wall, Dark Magician (Anniversary Edition), Dark Magician Girl (Anniversary Edition), and Ashoka Pillar; Aki Izayoi/Akiza Izinski (Duel Academy alternate version) as an opponent; and Triangle – Circle for use. Yu-Gi-Oh! 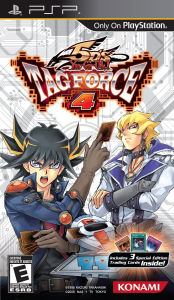 GX: Tag Force 3: Obelisk the Tormentor (Effect Monster), Blue-Eyes White Dragon (Anniversary Edition), Berserker Soul, Miracle Contact, and Cabrera Stone; Kalin Kessler (Team Satisfaction alternate version) as an opponent; and Triangle – Circle for use. Successfully complete the indicated task to unlock the corresponding partner. After unlocking the ones that have an alternative story (for example, Carly and Yusei), take them to Lenny by the shoreline, and choose “I want to see my partner in a new light”. Akiza: Use the “UMD Recognition” option. Dark Singer Carly: Successfully complete Jack’s storyline. Dark Signer Kalin: Successfully complete Yusei’s storyline. Dark Singer Misty: Successfully complete Akiza’s storyline. Devack: Successfully complete Luna’s storyline. Enforcer Kalin: Use the “UMD Recognition” option. Mimicry: Successfully complete all page one storylines (Akiza, Jack, Yusei, etc.). Mina: Use the “UMD Recognition” option. Rex Goodwin: Successfully complete Singer’s storyline. Testu Trudge: Successfully complete Trudge’s storyline. Yusei: Successfully complete Rally’s storyline. The following card packs are available in the game. Note: All packs except for the final five will become unlocked once you reach level 25. Applied Monsters: Get over 50% of Monsters 101. Applied Magic: Get over 50% of Magic 101. Applied Traps: Get over 50% of Traps 101. Master Monsters: Get over 50% of Applied Monsters. Master Magic: Get over 50% of Applied Magic. Master Traps: Get over 50% of Applied Traps. Afraid Of Me: Enter the shop on Monday. Where There’s Smoke, There’s Me: Enter the shop on Tuesday. Me Under The Bridge: Enter the shop on Wednesday. Run Like Me: Enter the shop on Thursday. Me At The End Of The Tunnel: Enter the shop on Friday. Feeling Me Shake: Enter the shop on Saturday. Duelin’ All Week Long: Enter the shop on Sunday. Ugly Duckling: Enter the shop with Rally or Yusei. Black Paint: Enter the shop with Crow, Jack, or Kallin. Mark Of The Red Dragon: Enter the shop with Akiza, Yusei, Jack, Luna, or Leo. Symbol Of Dark Revenge: Enter the shop with Roman, Kallin, or Devack. Fine And Dandy: Enter the shop with Dean, Trudge, Lioside, Wade, or Georg. Mon Ami, Mon Amour: Enter the shop with Misty, Mina, or Carly. Road Of Light: Get over 60% of each pack in Row 1 and Row 2. Brutal Battle: Enter the shop with Leo. Bound To The Mortal World: Enter the shop with Luna. Born To Steal: Enter the shop with Anca, Simon, or Misty. Joker’s Full House: Enter the shop with Luna. Chain Of Command: Enter the shop with Wade. Gateway To Happiness: Enter the shop with Mina or Wisteria. Youthful Memories: Enter the shop with Rayna. Habitual Ritual: Enter the shop with Wisteria or Celia. Gathering Stars: Enter the shop with Yusei. Tactical Instinct: Get over 50% of cards. Crocodile Tears: Enter the shop with Andrea, Jack, or Misty. Bizarre Wizard: Enter the shop with Carly or Rio. Another Kind Of Justice: Enter the shop with Kallin or Nadia. Cannons And Roses: Enter the shop with Aki, Anca, Trudge, or Yusei. Warrior’s Dress Code: Enter the shop with Cherry or Leo. Angels And Animals: Enter the shop with Mina or Misty. Beast Kingdom ’87: Enter the shop with Cherry or Crow. Soul Flower Unit: Enter the shop with Akiza. Natural Born Critters: Enter the shop with Akiza or Olivia. Radial Instinct: Get over 50% of cards. See You Next Time: Successfully complete a Yu-Gi-Oh! 5C’s character. Lovey Dovey Deck: Get the Dark Magician Girl, White Pikeru, Ebon Curran, Card Ejector, and Cyber Tutu figures at the item machine, then enter the shop with them all present. 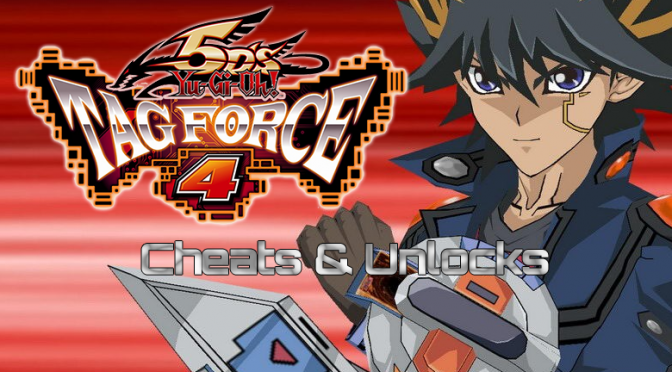 Generation Next: Use the PSP Game recognition option with UMDs or ISOs from Yu-Gi-Oh! GX Tag Force and Yu-Gi-Oh! GX Tag Force 2. High Noon Constellation: Unlocked with a cheat code. Black Checkers: Get over 90% card completion.